Peptide EGFAQENSKYNKTC, corresponding to amino acids 367-380 of rat mGluR5 (Accession P31424). Extracellular, N-terminus. Homology Mouse - identical; human - 13/14 amino residues identical. Standard quality control of each lot Western blot analysis (unlabeled antibody, #AGC-007), and immunohistochemistry (labeled antibody). Immunohistochemical staining of perfusion-fixed frozen rat hippocampus sections using Anti-mGluR5 (extracellular)-ATTO-594 Antibody (#AGC-007-AR), (1:50). 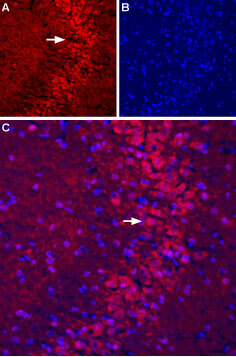 A. mGluR5 (red) is detected in pyramidal layer neurons (arrow). B. DAPI is used to visualize cell nuclei (blue). C. Merge of A and B.
Kew, J.N.C. and Kemp, J.A. (2005) Psychopharmacology (Berl). 179, 4. 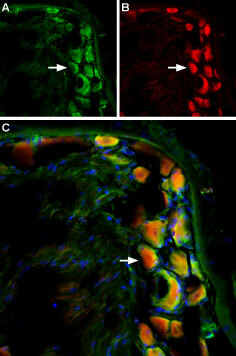 Ferraguti, F. and Shigemoto, R. (2006) Cell Tissue Res. 326, 428. L-Glutamate, the major excitatory neurotransmitter in the central nervous system, operates through several receptors that are categorized as ionotropic (ligand-gated cation channels) or metabotropic (G-protein coupled receptors). The metabotropic glutamate receptors family includes eight members (mGluR1-8) that have been divided into three groups based on their sequence homology, pharmacology and signal transduction. Group I of the metabotropic glutamate receptors includes the mGluR1 and mGluR5 receptors. The receptors present the typical G-protein coupled receptor (GPCR) signature topology: seven transmembrane domains with a large extracellular N-terminus domain and an intracellular C-terminus one. The N-terminus domain of group I receptors contains the glutamate binding site while the cytoplasmic C-terminus domain has an important role in the regulation of receptor activity through interactions with other proteins such as the Homer adaptor proteins. mGluR1 and mGluR5 receptors signal through Gq/G11 that activates phospholipase C and ultimately produces an increase in inositol trisphosphate and cytosolic Ca2+. More downstream signaling pathways include activation of PKC and modulation of Ca2+ and K+ ion channels. Activation of signaling pathways independent of G-proteins has also been reported. 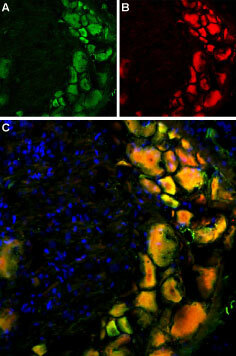 mGluR5 is predominantly expressed in nervous tissue although expression in several non-neural cell types has also been described. In the brain it is highly expressed in the cortex, basal ganglia and hippocampus. The mGluR5 receptor is involved in several physiological processes such as neuronal development, induction of long-term potentiation (LTP) and depression (LTD) as well as in pathological disorders such as brain trauma, chronic pain, Parkinson’s and Huntington’s disease. Immuno-colocalization of TRPV2 and mGluR5 in rat DRGImmunohistochemistry of rat dorsal root ganglion using Guinea pig Anti-TRPV2 (VRL1) (extracellular) Antibody (#AGP-033) (1:60) and Anti-mGluR5 (extracellular)-ATTO-594 Antibody (#AGC-007-AR) (1:60). 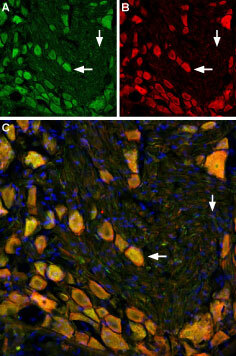 A. TRPV2 staining (green). B. mGluR5 staining (red). C. Merge of A and B demonstrates co-localization of TRPV2 and mGluR5 in DRG cells. Nuclei are stained using DAPI as the counterstain (blue). Anti-mGluR5 (extracellular) Antibody (#AGC-007) is a highly specific antibody directed against an extracelluar epitope of rat mGluR5. The antibody can be used in western blot analysis, immunhistochemical and live cell imaging applications. It has been designed to recognize mGluR5 from rat, mouse and human samples. Anti-mGluR5 (extracellular)-ATTO-594 Antibody (#AGC-007-AR) is directly labeled with an ATTO-594 fluorescent dye. ATTO dyes are characterized by strong absorption (high extinction coefficient), high fluorescence quantum yield, and high photo-stability. The ATTO-594 fluorescent label belongs to the class of Rhodamine dyes and can be used with fluorescent equipment typically optimized to detect Texas Red and Alexa-594. Anti-mGluR5 (extracellular)-ATTO-594 Antibody has been tested in immunohistochemistry and is especially suited for experiments requiring simultaneous labeling of different markers. Anti-mGluR5 (extracellular) Antibody (#AGC-007), (for western blot analysis).